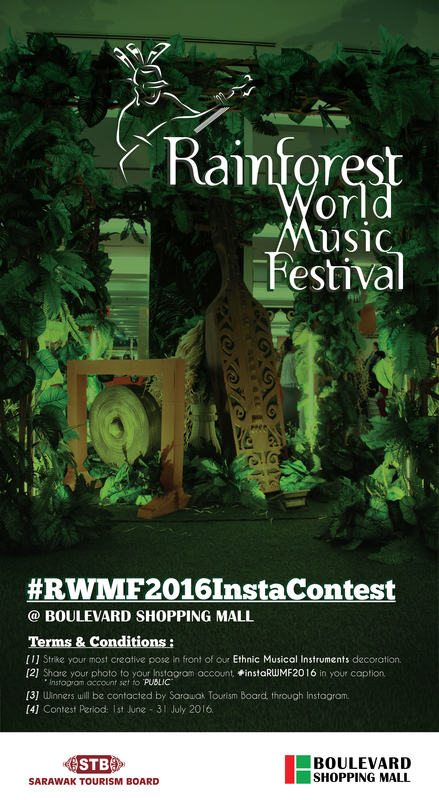 Win a chance for Rainforest World Music Festival? 1) Strike a photo with our instruments decoration inside the mall. 2) Share it to your instagram with caption “‪#‎RWMF2016InstaContest‬”, remember to set your account as “Public” and add location at Boulevard Shopping Mall, Kuching. 4) Contest Period: 1st June – 31st July 2016. 2nd: 3 sets of 3days RWMF Tickets. 3rd: 2 sets of 3days RWMF Tickets. Consolations (7 chance) : 2 RWMF entrance tickets.